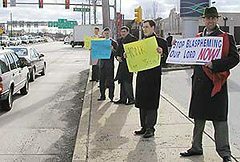 The American TFP > Anti-Blasphemy > NO! to the Blasphemous “Jesus” Doll! 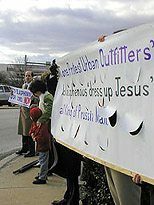 Outraged Catholics braved low temperatures and fierce winds as they lined Mall Street on March 21at the main entrance to the King of Prussia Mall in King of Prussia, Pennsylvania to protest a blasphemous “dress-up Jesus” doll sold by Urban Outfitters. Since the protest, the retailer has reportedly discontinued the sales of this offensive item. According to NBC10 news, the item looks like a children’s dress-up game but is really a magnetic Jesus dress-up figure on the Cross which gives the buyer the possibility of deforming Christ with interchangeable outfits such as a devil costume, a skull T-shirt and a hula skirt. The winds were swift but the protest waged on. The protest’s impact was immediately felt. Although the protest was peaceful and prayerful, mall security guards never left the protesters in peace. From time to time, they would warn protesters not to step on Mall property or even to use the Mall’s parking lot. Everyone got the message that the “dress-up Jesus” doll was not a “game” but a blasphemous insult to Our Lord. To attack Christ on the cross could not be more cruel or cowardly. 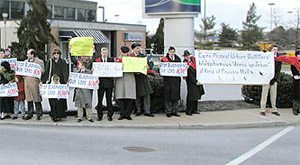 Catholics voiced their outrage and protested, and made a beautiful act of public reparation. God’s honor was upheld by some. Hopefully, next time hundreds or even thousands will answer the call to say NO! to blasphemy. If Catholics do not profess their faith in public, nothing will stop the promoters of blasphemies from insulting Jesus and Mary.